The Pentagon’s army of space-age robot warriors is getting a lot more real. The Defense Advanced Research Projects Agency, or DARPA, has released video footage of a project that’s been long in the works and really starting to now take shape. The Protection Ensemble Test Mannequin — or “PETMAN,” for short — is the subject of the latest clip, and very well could be all it takes to scare off any insurgents once it’s ready for the battlefield. PETMAN is a bipedal robot that has been displayed during previous tests as having the ability to climb stairs and even do pushups. In the latest video, though, the experimental project is showcased as being more lifelike than ever before. Scientists at Boston Dynamics have released a video that shows PETMAN, clothed head-to-toe in full-on camouflage, jogging in place on a laboratory platform. But unlike earlier videos in which PETMAN appeared to be nothing more than a pile of wires enclosed in metal, the newest footage shows the science project at its all-time most humanness. PETMAN isn’t being tasked with running like a human being for simply the sake of being creepy, though. Boston Dynamics have outfitted the robot in high-tech protective camo clothing that is designed to keep soldiers — real, cyborg or other — safe from hazardous chemicals. 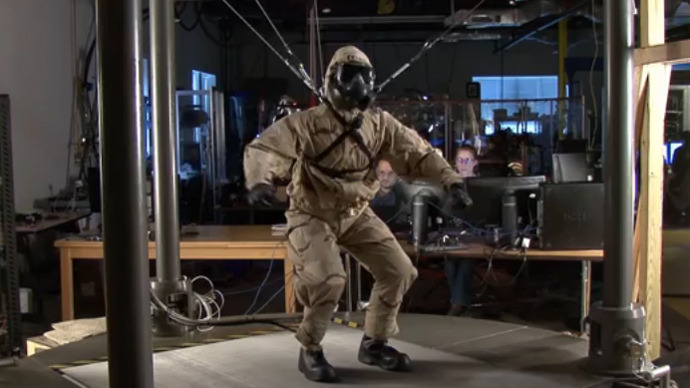 “PETMAN has sensors embedded in its skin that detect any chemicals leaking through the suit. The skin also maintains a micro-climate inside the clothing by sweating and regulating temperature,” explains Boston Dynamics. The robot, adds the scientists, can balance itself, move freely, walk and do a variety of suit-stressing calisthenics — all while being exposed to chemical warfare agents. "Natural, agile movement is essential for PETMAN to simulate how a soldier stresses protective clothing under realistic conditions,” adds Boston Dynamics. “The robot will have the shape and size of a standard human, making it the first anthropomorphic robot that moves dynamically like a real person." And yeah, PETMAN can walk the walk — but he doesn’t stop there either. Scientists have programed the robot to “simulate human physiology,” so that when being exposed to chemical agents, researchers can send signals to the robot that forces it to mimic human sweating and switch its body temperature like a real-life soldier might do while on the field. So with PETMAN being able to do all of that and then some, what does DARPA have planned next? That’s likely top-secret, but critics of the US Defense Department’s science lab say projects like this will lend themselves to changing the face of war from a human one to a robotic one. "It's going to be used for chasing people across the desert, I would imagine. I can't think of many civilian applications - maybe for hunting, or farming, for rounding up sheep,” Noel Sharkey, professor of artificial intelligence and robotics at the University of Sheffield, told the BBC previously in regards to DARPA’s robot creations. "But of course if it's used for combat, it would be killing civilians as well as it's not going to be able to discriminate between civilians and soldiers,” he said. Breaking! NRA is SUING Los Angeles over anti-gun city ordinance!